We trace the steps of the Apostle Paul, who reached Cyprus’ shores in 45 AD and travelled the length and breadth of the island preaching the Gospel. He was flanked by fellow Apostles Mark and Barnabas–the founder of the Church of Cyprus. In Paphos, Paul succeeded in proselytizing the Roman Proconsul Paulus Sergius, a catalytic event in the process of the island’s christianization and a watershed moment in the history of christianity as a whole. Some of the most historically significant examples of Byzantine painting are housed in churches spread throughout the centrally located Troodos mountain range. These are the carefully preserved frescoes that adorn the church walls, brilliantly crafted in the various styles of byzantine and post-byzantine monumental art and spanning a period between the eleventh and nineteenth centuries. >>> The program with photos…. Monasteries and Churches of Limassol. A program of visits to churches and monasteries dating from the twelfth century that have been conferred UNESCO status. 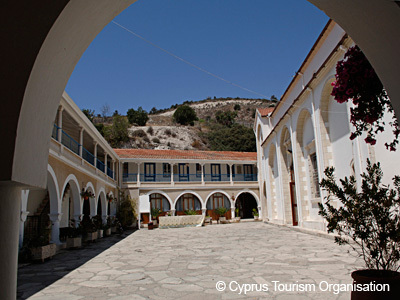 The tour also takes visitors through wineries along the Limassol wine route, oil mills and traditional workshops. The picturesque villages hidden in the mountain forests and lined with cobblestoned paths and sporting a unique architectural style are a special treat for country-living enthusiasts.